The 2018 BMW M3 CS will be the first four-door BMW to wear a “CS” badge, which was traditionally only slapped on the trunklid of swoopy coupes. But traditionalism is dead, sedans are hot right now, and this car looks like a freaking firecracker. 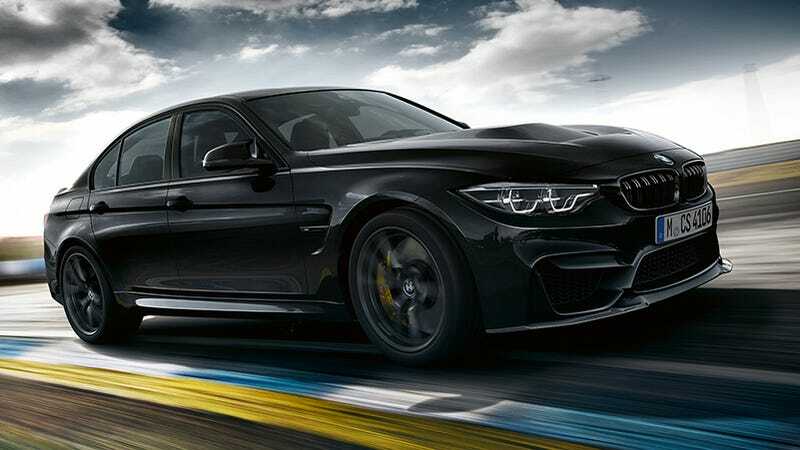 According to BMW the new M3 CS will be rated to put down 453 horespower and 443 lb-ft of torque. I’m not sure how much of that will make it to your tires once you cut this little beast loose on the street, since BMW recommends RON 98 octane fuel which you’re not going to find at too many gas stations. But the baseline is an impressive bump from the regular M3’s 425 HP and 406 lb-ft. Unless you got the competition package, in which case, the standard M3 can actually allegedly turn out 444 HP. Oh hell, what difference does it make how many horsepowers are tabulated in the brochure? You’ll spend a lot of money on the CS spec because it looks boss and it gets you into an elite club of special-edition BMW owners. Only 1,200 2018 M3 CSs are slated for production, of which a little less than half are supposed to come to the United States. No list price has been announced yet. But while the old M3 hangs on to a classic three-pedal manual, the M3 CS will only ship with BMW’s seven-speed DCT automatic. I would complain, but frankly that transmission is awesome in the M2 and I have a feeling it’s going to be pretty well dialed-in here, too. The M3 CS’s list of bragging rights continues with a 0 to 60 time of 3.7 seconds (a regular M3 does it in 3.9) and a top speed of 174 mph. The spec you might get the most practical benefit from in the M3 CS is its weight reduction, though. BMW claims it’s shed 110 pounds off the standard M3 sedan thanks to a carbon fiber hood, roof and various other accessories. You might recognize the rear diffuser from the mighty M4 GTS. Speaking of which, the interior accents remind me a little of BMW’s wild 4 Series coupe. Check out that sweet embroidery in the dash pad! I’ve had a hard time accepting the fact that the M3 nameplate only lives on a sedan now, but I have to say this thing looks like a legitimate halo car and I have a feeling it’ll be an excellent ode to what fun-practical car is supposed to be all about. Even without a three-pedal manual.